The front door of my son's school. In the wake of the parents protesting the food allergy accommodations of a first grader in Edgewater, Florida, I promised a glimpse at my son's Individual Health Plan, which is remarkably similar to the descriptions of the much maligned one belonging Tracey Bailey's daughter. Unfortunately, my son's I.H.P. is not in the specially designated blue expanding (and expanding and expanding) file that is home to the blizzard of documents my child seems to precipitate every time he comes into contact with our educational system. So I'm going to describe the most relevant provisions from memory with a few comparisons between the two. First a big disclaimer and then a little background: my memory is far from perfect. My apologies if I manage to misrepresent my son's accommodations, simply because I gapped out a relevant section. In addition, I have not personally seen Tracey's daughter's health plan. I am going strictly on Tracey's descriptions and the information given by school officials to reporters. Plus, our children's schools are in widely separated counties with different policies. Every person, whether student, staff or parent, entering my son's classroom must wash their hands at a sink just inside the door. Every student must rinse their mouth when entering the classroom first thing in the morning and immediately after lunch. I'll be honest; I was truly startled when I saw that the nurse had included the mouth rinsing provision in the I.H.P. It seemed a little extreme, and was not something that it would have ever occurred to me to request. This is also the procedure that has sparked the most controversy in Tracey's daughter's accommodations. Then I saw the mouth rinsing in action. There is a little water fountain on the side of the sink, and the kids are instructed to "swish and swallow" after they wash their hands. That's IT. All they are doing is taking a sip of water from a fountain. Quite frankly, it's a good idea to encourage kids to drink more water in general here in the Florida heat. I am at a loss to even understand the controversy about the hand washing, since it's just good hygiene and a basic safety measure. As far as the time that washing hands and taking a sip of water requires, the protesters have manufactured the statistic that they are required to do this three times a day and it takes ten minutes each time, causing a total loss of thirty minutes from academics each day. This is pure fiction. First, it is twice a day, after arriving from breakfast at home and after eating lunch at school, both for Tracey's daughter's and my son's classrooms. Second, washing up in the morning does not take away class time, since it is done upon arrival before class even starts. At Edgewater Elementary, the students leave packed lunches on a cart outside the classroom, which is taken to the cafeteria. Neither school bans any food, including peanuts or peanut butter. Both plans initially called for the child to eat separately from the other students. This is where we asked for less restrictions than the nurse's plan prescribed. My son was very upset at being isolated from the other students at lunchtime. He felt it was a punishment for his food allergies. So we requested that he eat in the cafeteria in a designated place, which is wiped clean before he sits down. Children who are eating peanut butter, because of the violence of that particular allergy, or drinking milk, because of the spill potential, just don't sit next to him. (That's right, 7 and 8 year old children do their part to keep my son safe with awareness and compassion.) He had an aide assigned to him during lunchtime, but everything has gone so well, that he now eats without the aide. I am very, very aware of the risks involved in having my son eat lunch with the other students in the cafeteria. Another child at my son's school with severe food allergies eats in a classroom with a friend of his. My thoughts are that I would rather have him gradually start learning to function independently in an unsafe world, while supervised by adults who genuinely care for his well being and have appropriate medical training to handle any accidents, but I still worry. No homemade food may be given to the students. It must all be store bought and clearly labeled with ingredients. For the last two years, though, the teacher has been simply amazing and allowed me to provide all of the treats for school parties. (She moved up from first to second grade with the class.) In addition, she even came up with a workaround, which allows me to bake safe treats for parties. The school has a full kitchen in the Kindergarten wing, so the day before a class party, I go in with unopened packages of ingredients, such as flour, sugar, etc., and bake on the premises. They eliminated snacks due to the early lunch time at 10:45am, as did the fourth grade teachers for the same reason. They decided to do crafts instead of eat treats at holiday parties as part of the school's focus on healthy living. Here's the real difference: the other parents in my son's class have been nothing but supportive. They have repeatedly expressed their concern for my son's safety and their appreciation for the goodies I provide. 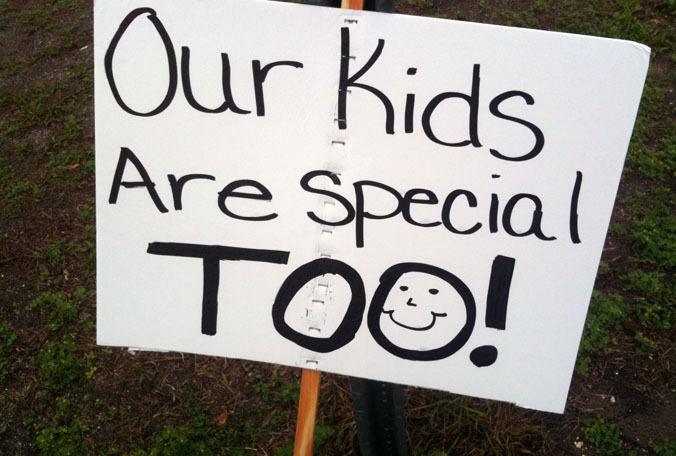 At Edgewater Elementary the parents have blamed a six year old girl for school policies unrelated to her disability. They also protested outside her elementary school with inaccurate information about her accommodations without either verifying her actual health plan or approaching either the school administration or the child's parents appropriately. I truly believe that while plans to protect children with food allergies are critical, the people who implement them are even more important. Education about food allergies is meaningless without a willingness to be educated and the compassion required to keep a small child safe by something as simple as hand washing. Update: A Facebook group has been started to support the Bailey family, if you'd like to join us. So informative and helpful. Well written. Thank you for improving my understanding of the situation. I have chills after reading this....loved the comparisons and said all with integrity. Well written! Thank you! 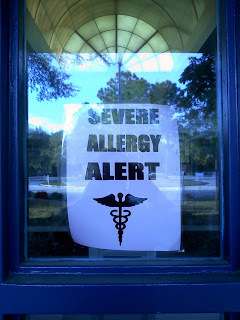 I have been very stressed at the thought of our son w/severe multiple food allergies entering Kindergarten in light of the happenings in Edgewater, FL. Great article. So glad to hear that some people can deal with food allergies with compassion. Just sad that not everyone can experience acceptance and coooperation when it comes to food allergies. Love this post. And love being follower 100 :) But really, this is very informative. 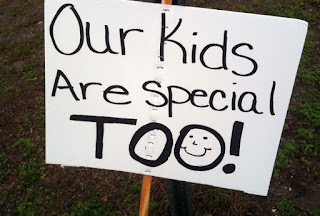 As a mama with a little anaphylacticly allergic to tree nuts I get it AND agree--Our kids are special too. Just saw this on FAAN. I read your lastest post and have to say it was very calm and well thought out. I was (still am) so angry because of the ignorance. I could hardly create a rationale thought about this whole thing. My oldest, who has NO food allergies nor does he have anyone in his pre-k class who does, is required to wash his hands when he gets to school (before class starts), after lunch and after coming in from the playground. It is about hygiene and should be practiced in every school. Thank you for this. I really appreciate your take on all of this. My son has a peanut allergy and I've been at a loss for words regarding this whole situation in Florida. My heart goes out to this family and little girl. Your article is informative and well written. My intial feeling was that there had been a mass overreaction. The facts stated have only confirmed these thoughts. My children both have food allergies, my youngest with multiple including peanuts, begins kindergarten in the fall. I have offered allergy education classes to the children for three years for both of my children. They have received nothing but compassion and understanding from their peers, teachers and other families. Thank you for the hope this article provides for others. Wow! Thank you for this article. I'm going to share it with everyone who has been arguing with me about it - how these same measures have been implemented at other schools without it causing any issues. AMAZING. Thanks so much! I thought it was interesting that you mentioned having to get your kid reassigned to this school. The same thing happened to us, where the district assigned our child to a non-food allergy friendly school, but unfortunately the outcome was not as good as yours. I'm really glad that FAAMA was out and that this is now being discussed outside the FA community. I hope that this will lead to well-documented and clear policies for FA parents so they can know how to navigate the system of their particular school district. That way you won't have these one-offs where the same situation could have a really good or really bad outcome- and you have little control if the outcome is bad as a parent. I hope everyone reading these will do what they can to support clear guidelines and training regarding food allergies in schools. It needs to start at the administrative level. Wow, this is really something. Read your other post too. My son has food allergies and so far his preschools have been supportive. It's hard to imagine how rude people can be - but then again, it isn't. Thank you, Mom, Teachers, other Kids, and supportive parents for helping to keep my one and only precious and well-loved Grandson safe. Best wishes to all of you allergic kids and "Allergy Parents" out there. I'm proud of our Allergy Mom!" A great Blog!